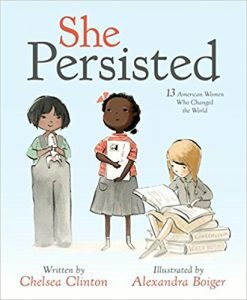 Inspired by the infamous rebuking of Senator Elizabeth Warren while reading the words of Coretta Scott King during the confirmation hearings of then-Senator Jeff Sessions, author Chelsea Clinton introduces 13 women in “She Persisted” who have shown persistence throughout American history. The women she chose to include this book are varied in race and career aspirations, yet all have striven in their lives to never give up. One thing that this simplified and child-friendly retelling of history does well is that the women selected are not those often chosen for such public acclaim. Harriet Tubman, Helen Keller, and Sally Ride all make the list with their incredible challenges and perseverance but so do less well-known inspirations – Clara Lemlich, a Ukrainian immigrant who helped organize protests for safer working conditions; Maria Tallchief, a Native American dancer who went on the become one of America’s first prima ballerinas; and Claudette Colvin, an African American woman who refused to give up her seat on a public bus and inspired Rosa Parks to do the same nine months later. Alexandra Boiger illustrates this well-written book with careful watercolor illustrations depicting each of the strong women represented. This would make a fine introduction on women’s American History. A simple misunderstanding between sneezes confuses a wish for world peace for world pizza and soon pizzas of all descriptions are falling from the sky in “World Pizza.” It is hard to not be enjoying yourself while tasting delicious pizza and the characters of this book agree. Cece Meng writes a story of pizza falling around the globe and people in cities, villages, in the wilderness, the wealthy, the poor all enjoy a tasty hot meal. With full bellies and a happy attitude even the most disagreeable people become friends. 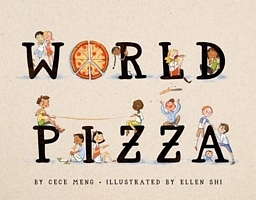 Ellen Shi’s illustrations help bring this community of pizza lovers together showing that a wish for world peace just may be achieved through a wish for world pizza. 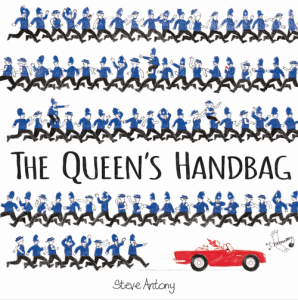 Steve Antony has already created fanciful tales of HRH Queen Elizabeth II and “The Queen’s Handbag” is no different. While on parade in London, a swan snatches the Queen’s handbag and flies away with it. In pursuit of it, the crisp blue, red, and black ink illustrations show off some of the United Kingdom’s great settings. Windsor Castle, Stonehenge, the White Cliffs of Dover, and the Edinburgh Castle all play a part as the Queen chases after the swan. Aside from appealing yet simple pictures, a great detail to this book is the index in the back that explains additional details about each of the settings the reader travels through.